I’d just like to say a huge thank you to you all for putting on this great festival. Thoroughly enjoyed being part of the team involved in building the bench for the community. Everyone gelled well and the banter was top class. Also very impressed at the activities which were put on after we had finished such as the talks and the heritage centre visit. Entertaining and informative (and that’s just George Gunn lol) and set in a wonderful landscape. Highly recommend it to anyone to come along next year Northstone Stonefest and join in. I, for one will be making the return journey in 2017! Dear Mr. Gunn, I would just like to formally thank you for inviting me to speak at your festival and congratulate you on running a great event. It was a wonderful experience. Having attended and help organise a number of similar events on both sides of the Atlantic over the past few years it is hard to believe that this was your first festival, and indeed the first festival of its kind in the UK. I commend you on the level of professionalism of the festival. It was also wonderful to experience some of the areas rich stone heritage. It has opened my eyes to the beauty of this area. I wish your festival much success in the future and hope you enjoy continued support for local groups and organisations as I know how vital that support is in making these events a success. It is also great to see how the local community intern benefits from such events. I look forward to visit this area of Scotland again. Thank you for a memorable weekend. It was great to come up, was a brilliant festival. Thanks for having me. I felt the event was very well organised, breaks were an important part of the day which allowed for networking and friendly chat. Health and safety considerations were well covered. The guest speakers were very interesting and provided an insight into their working practices. It couldn’t be bettered for location – the North of Scotland provided the stone enthusiasts with a ‘geological feast’ ! My view on the festival. I was invited to take part in the festival held at Thurso Caithness Scotland by George Gunn, DSWA Master Craftsman and festival organiser. I decided to go and to travel on my motorbike, this resulted in a trip of over 1,400 miles door to door. It was my ﬁrst walling festival and it was a pleasure to take part. George’s organisation was very good with wonderful accommodation and food. The three guest speakers Lydia, David and Sunny were very informative and varied in their presentations. Supporting extra events, in and around the area were both interesting and varied. Rowing a skiff at sea was something totally different and several wallers took the opportunity to take to the oars, I have to say I was not one of them. The build was a challenge and started in a savage gale force wind that almost wrecked the marquee ! All hands were needed to hold down the marque whilst rebar was used to brace the roof bars! 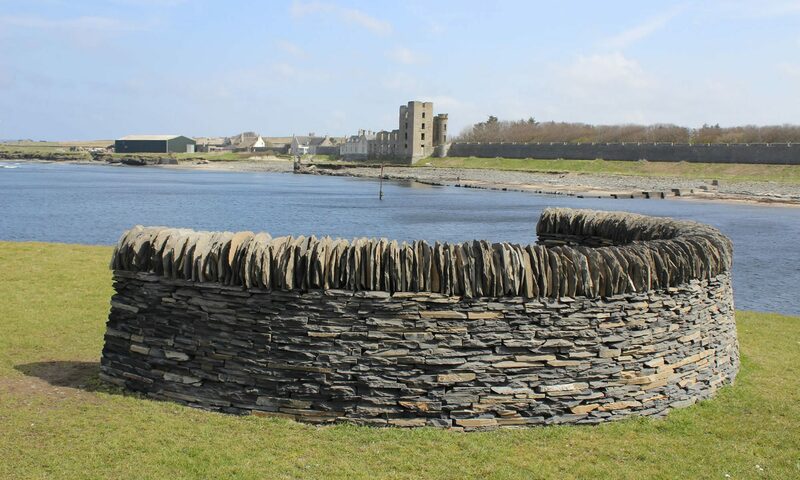 George had designed a half circular seat which was built on a prominent headland site near to the river and harbour. It was my ﬁrst time of working with a team of master craftsmen. George, Nick, Sonny, David and Joe plus several other professional wallers including Lydia and Phil and supported by many others from far and near. This was a pleasure and an experience that I will treasure for a long time. Over the three days of the build it attracted a lot of local attention and was very well received. Working with Caithness Flagstone was a new experience for me and was much tougher than I expected. Having to make hundreds copestones between us all was a real challenge but the ﬁnished result was outstanding. I really enjoyed the event and the good company. My congratulations to George and his wife who supported him and everyone involved. This formed a vital part of the very successful weekend festival. Very well organised, things worked well, enjoyed seeing a variety of approaches and skills. Great experience, I learnt much from the excellent instruction. George organised a great itinerary and our time was well filled. Exceeded my expectations, warm and friendly atmosphere, really enjoyed meeting new people and expanding my skills/knowledge. Great sites and fabulous venues and entertainment. As a first time event I think the organisers have done very well. Well done George and Sue lots of hard work but hope you both feel very proud, you certainly deserve to. Thank you. Enjoyed working in a good team, flagstone quarry very interesting ( Castlehill ) very good weekend. I enjoyed meeting kindred spirits and working with local stone, well done George and Sue and the caterer too! Great festival thank you, very happy. Was better than my expectations. Previous PostPrevious We made the local paper again.